(ZIZ News) — The Prime Minister Dr. Hon.Timothy Harris updated citizens and residents on matters of national interest at the Prime Minister’s Monthly Press Conference held at the Parliamentary Lounge at Government Headquarters on Wednesday October 26. The Prime Minister addressed several topics, including the 86th Meeting Of The Monetary Council, updates on the CBI Program, the state of the economy, the progress of Police Investigations, Law and Order and issues relating to the Federation’s Immigration policies. During the conference, Prime Minister Harris also spoke of plans to nominate a new Deputy Speaker after making mention of the swearing in of a new Senator on Wednesday morning. Minister of Education, Hon Shawn Richards, Minister of State, Hon Wendy Phipps, Attorney General Hon. 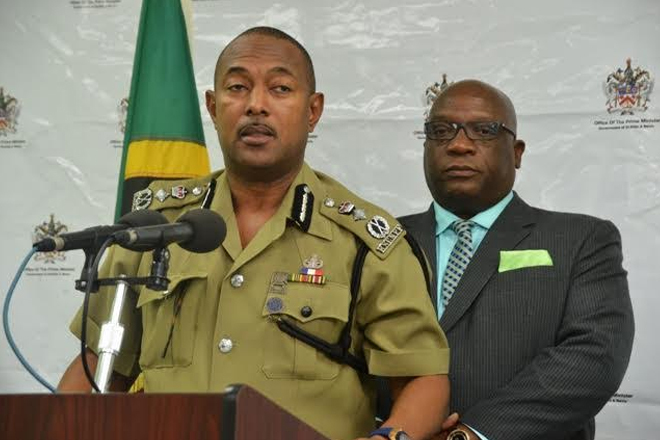 Vincent Byron, Premier of Nevis the Hon Vance Amory, Minister of Tourism the Hon Lindsay Grant, Cabinet Secretary Josephine Huggins and Members of the Police High Command were in attendance at the monthly conference. The monthly press conference gives the media direct access to the Prime Minister on a regular basis and keeps residents informed of the operation of his administration. Press Secretary to The Prime Minister, Valencia Grant chaired the conference. The Prime Minister’s monthly press conference was streamed live on ZIZ radio 96.1 FM and Television Channel 5.